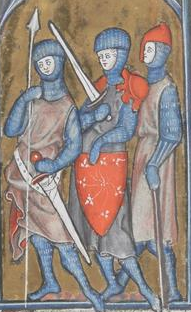 Forum Index > Historical Arms Talk > Early Splinted Vambrace...Or Is It A Gambeson? Posted: Mon 08 Jan, 2018 4:33 am Post subject: Early Splinted Vambrace...Or Is It A Gambeson? of mail (minus a few of the aforementioned gambesons) and one illumination features full sleeves with bare hands. In summary, nothing else within the illuminations approximate that forearm...and what appear to be gambesons with mittens are depicted in different colors. You can see the attached picture in question, and follow the link below to the rest of the manuscripts - 19 in total, most without mail. I have some of my own thoughts and interpretation on this, but would love to hear what others think. As it appears to be worn above a mail mitten, I will have to presume it is meant to represent some sort of Romano-Byzantine splinted vambrace. The King of Sodom statue at Rheims Cathedral shows similar defenses over the shin and upper arm. Another possibility would be some sort of gamboissed or baleen reinforced cuff of the mitten. It would appear that the spaulders-of-some-kind on the middle figure share some similarities with the King of Sodom statue as well. I’m also wondering if the Phrygian helmet on the vambraced-character might also indicate some sort of foreign representation. It would seem that they were aware of splints, even before there use became more widespread 50 years or so later. The text is difficult to read, I’d try to translate if I could make more sense of the script.